The S4Shardwoods.com advantage in the market starts with over a century of experience through four generations of the Thomas family. Having supplied millwork houses for over 100 years, we know the product best suited for our S4S Lumber customers. The pre-selected material for manufacturing delivers superior quality with the highest yield at the lowest cost. Our 20 acre production facility and lumber yard means an extensive and diverse inventory is always on hand. 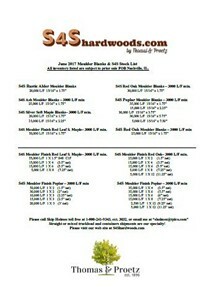 S4Shardwoods.com proudly delivered over 7 million lineal feet of S4S lumber last year. Ongoing investments in production capacity will allow us to reach this year’s goal of 10 million lineal feet. Specialized in the ultimate moulder finish at 18 to 21 “Knife Marks per Inch” (KPI). Priced by piece count. Never a wheel count! Available in our “Architectural Grade” Clear 1Face 2 Edge and “Contractor Grade” Product of the Grade fit any project or ongoing program requirement. Available in a wide range of widths in stock for immediate shipment in both traditional S4S and Cabinet Frame widths. Both nominal and frame S4S Lumber in stock. Cabinet S4S Face-Frame in 1.5″, 1.75″, 2″, 2.25″, and 2.5″ widths on S4S Poplar, S4S Red Oak & S4S Red Leaf Soft Maple are always in stock.